Ninja&reg; Coffee Brewer is a 12-cup programmable coffee maker with Custom Brew Technology to ensure your coffee is hot, flavorful, and never bitter. From a Small Batch to a full carafe, Classic or Rich strength, you can expect the same great taste. Our removable water reservoir allows for easy filling without the mess. The brew basket lid ensures no coffee grounds end up in the reservoir. Ninja's Thermal Flavor Extraction&reg; Technology allows you to unlock the full flavor potential of your favorite ground coffee and enjoy a great-tasting brew. With the Ninja&reg; XL Showerhead, rest assured your coffee grounds will be evenly saturated for uniform flavor extraction. 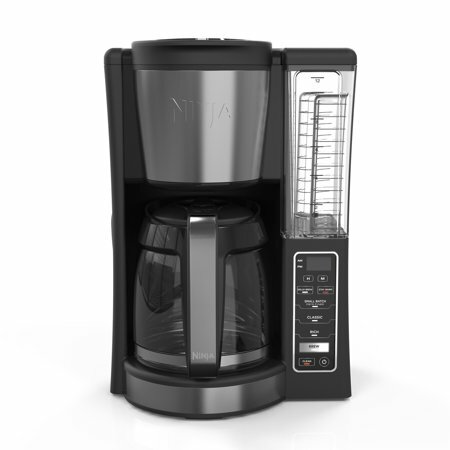 With this Ninja® coffee maker, choose from Classic or Rich strengths. Each brew is hot, flavorful, and never bitter with Custom Brew TechnologyConveniently carry the 60 oz. removable water reservoir from the coffee brewer to your sink for easy fillingUnlock coffee's full flavor potential with Thermal Flavor Extraction® TechnologyKeep coffee fresh and flavorful with our Flavor Straw and Precision Temp Warming PlatePour yourself a cup before a brew is complete with Mid-Brew Pause24-hour programmable delay brew allows you to prepare your brew up to a day in advance Ninja® Coffee Brewer is a 12-cup programmable coffee maker with Custom Brew Technology to ensure your coffee is hot, flavorful, and never bitter. From a Small Batch to a full carafe, Classic or Rich strength, you can expect the same great taste. Our removable water reservoir allows for easy filling without the mess. The brew basket lid ensures no coffee grounds end up in the reservoir. Ninja's Thermal Flavor Extraction® Technology allows you to unlock the full flavor potential of your favorite ground coffee and enjoy a great-tasting brew. With the Ninja® XL Showerhead, rest assured your coffee grounds will be evenly saturated for uniform flavor extraction. I was excited to try this coffee brewer since ninja is a very well known brand and I was right, once of the bests! The design it's very nice, you can detach the water reservoir to fill it out and you can always wash it when needed! The pot's lid it's removable and that's another feature it's great for cleaning purposes. It holds 12 cups and had the option to make a stronger brew if you wish along with the traditional timed program settings. I loved this machine, It's totally worth it! For all coffee love makers, like myself, the Ninja Coffee Brewer is the perfect coffee maker station. You can even plan or program it up to 24 hrs. in advance to brew your coffee. You actually can plan to make your coffee 1 day in advance, from 1 cup up to 12 cups. This coffee maker has a Custom Brew Technology that ensures your coffee is hot, flavorful, and never bitter. From a Small Batch (1 cup to 4 cups) to a full carafe (12 cups), Classic or Rich strength, you can expect the same great taste. Its removable 60-ounces-water reservoir allows for easy filling without any mess. The brew basket lid ensures no coffee grounds end up in the reservoir. Its Thermal Flavor Extraction Technology unlocks the full flavor of your favorite ground coffee and enjoy a great-tasting brew. It keeps the coffee fresh and very flavorful with its temperature warming plate. This is my favorite Ninja Coffee Brewer. I use it all day long! I set it,, and forget it! This is a very good product. I really love this coffee brewer. Coffee comes out hot - just the way I like my coffee. Coffee has no aftertaste like from some of the coffee makers I've used in the past - but it comes out with the taste as good as my favorite donut shop coffee. It is sturdy, well-made and works great. Love the fact that my coffee is waiting whenever I get up in the morning. A fantastic product! What a perfect way to begin a day!! This coffee pot is fantastic!! It brews up to 12 cups at a time.. There has a temp warming plate to keep your coffee the correct temperature while turned on. You can also brew a small batch if you prefer and still get a great rich cup of coffee. Best feature it this coffee Ninja machine is programable so you coffee will be waiting for you at the time you set it to begin brewing. You can use s paper cone filter or insert the washable basket if you prefer. The washable cone basket is not included with the unit but they are available all over, even at your local grocery store. If you love fresh brewed coffee, this is the machine for you!! The Ninja 12-Cup Programmable Coffee Brewer CE200 model is a great coffee maker. Whether you want to make 2 cups or 12 cups, this coffee maker can accommodate – 2, 4, 8, or 12 cups! The Ninja comes with a scoop that attaches to the side of the coffee maker which makes it easy to keep track of! With previous coffee makers, I've lost the scoop within 6 months of owning the coffee maker so then the “guess method” ended good coffee. The warming plate also keeps the pot warm without scalding your coffee if there isn't much in the pot. This, in my opinion, is a good feature. Often times, I have thrown out the last cup of coffee because it “cooked” too much on the warming burner. I have to say the Ninja brews a perfect pot of coffee every morning. Of course, like most coffee makers, you can set it up the night before and program it to have your coffee ready for you in the morning. The cleaning cycle is a wonderful feature of the Ninja coffee systems. One word of warning – do not let your water reservoir run empty! It causes a water bubble in the machine and then you get all kinds of weird gurgling noises when your coffee is brewing. While K cups may be easier, the 2, 4, 8 or 12-cup Ninja settings are more economical, and you don't get grounds in your coffee! A wonderful cup of coffee! The Ninja 12 cup programmable coffee brewer CE200 is a fantastic coffee maker. I have had many coffee makers, that I liked, but I will have to say that the Ninja Programmable Coffee Brewer CE200 is the best I have had so far. There are so many things I like about this coffee maker, but the clear removable water reservoir is one I really like. It is easy to fill, with the amount of water you need for the number of cups you want. This coffee brewer is so easy to use, because it is marked well. All you have to do is push buttons, and you have the best tasting coffee......no bitterness at all. It comes with easy to understand instructions if needed, but honestly, you will know what to do without it. The picture I attached will show you how it is marked, so you will know what I mean. Everything is so easy to read. Just program the Ninja coffee brewer, and wake up to a wonderful pot of coffee. Another plus to the Ninja coffee brewer is that there are no grounds in the bottom of the pot. There is nothing worse than getting coffee grounds in your mouth. The way this coffee brewer is made is the way every coffee brewer should be made. It is programmable, has easy to read buttons, has a clear removable water reservoir, different brew strengths...rich or classic, and makes terrific coffee. I am so happy with the Ninja 12 Cup Programmable Coffee Brewer CE200. After receiving this Ninja Coffee Brewer I began using it in place of the one I have been using and have found it to be a much improved machine and have been enjoying the the quicker and better brewing capability of the Ninja over my regular machine. I can highly recommend getting a Ninja it works great and looks quite impressive on my counter. This Ninja 12-cup coffee maker has all the bells and whistles you could ask for in a coffee maker. You can make as little as one cup, The filters that you use are the cone type, not the flat rounded type. I think this is the reason it makes a more flavorful cup of coffee. There are 2 setting one for classic and one for rich brew. The coffee is not bitter, but I believe that has a lot to do with the type of coffee you buy, however, I also think the coffee maker itself contributes to this with what they call a flavor straw that goes down into the glass carafe and the way it saturates the coffee grounds. The carafe does not drip, which I have had problem with other coffee makers. The reservoir is easy to remove and fill and the fill marks are easy to read. It locks into place easily. The delayed timer is a nice feature as well. The coffee plate can be set to warm to ensure hot coffee without burning it. You can pour yourself a cup in mid brew and the brewer stops until you return the carafe to the hot plate. I would not hesitate recommending this coffee maker. Best coffee maker I've had yet! I received this as part of the Walmart Spark Reviewer program. I absolutely LOVE this coffee maker. My favorite feature is the external water reservoir so no icky building up or worries about contaminated water down the line. There are many different options on settings and programming. Overall this is a great machine that makes coffee quickly and looks amazing. Also made with quality materials. I got to try this ninja 12-cup programmable coffee brewer from Walmart spark reviewer for free in exchange for my honest review. I, We ( my family and I) would recommend this coffee maker. I like that it stylish. I like it can make up to 12 cups of coffee. I like that it has a clock on it with an hour and minute button on it. I like that there's a timer on it that you can set the night before and it will cut on whatever time you have it set for before you get up in the morning and be ready for you. I like that it has a removable water reservoir. I like that has a delay button. It has a stay warm button. The stay warm button is where the plate stays warm that you said your coffee maker into and it has an automatic shut-off if not used within 2-hours but the warm button will keep your coffee warm for up to 4 hours. There's a small batch button that makes up to 4 cups of coffee. There's a classic button for smooth regular basic coffee. There's a rich button and it just makes a richer coffee and holds up when you add milk cream or flavoring to your coffee. There's a clean button on the coffee maker that it cleans/descales the coffee machine. But you still have to clean your coffee pot with warm soapy water and the removable filter holder. There's a brewing button which makes your coffee and an on-and-off button. It's a really nice coffee maker and we love it. We make coffee and tea in it. Here is a couple pictures to show you.